Why have home care visit for your pets? Home visit is an alternative to Boarding. The animal stays at home to avoid stress and anxiety. On what occasions can you use this service ? What happens before you signing the contract ? A preliminary visit to your home to understand the behavior of your pet and its environment. Through this appointment I will learn to know your animal, its habits, fears. What serice can I do for you ? Maintenance of litter trays, cleaning kennels, feeding, letting thedogs out, brushing, any required medication, and of course all the affection and stroking. With regard to hygiene, and feeding all equipment necessary for the maintenance of animals (litter, grooming items, cleaning equipment, foodstuffs ...), are provided by the owners. How to calculate the cost of home care for your pet ? 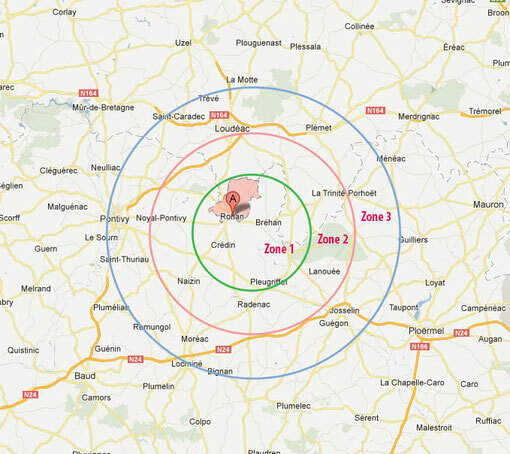 You will find below a map with defined zones from 1 to 3 in order to locate your distance from Tranidom Services. When you have found your zone you can calculate your quote. Example: You go on vacation, you live in Noyal-Pontivy (Zone 2), you have a dog and a cat to keep for a week from Saturday morning to Friday night at home, you want TRANIDOM Home Care Services twice a day for half an hour (morning and evening). The cost will be: 6 days during the week and one Sunday. If you are having problems calculating the amount of your service or you live outside the zones, please to contact me through via email or the contact form on the web site. I will answer all your questions andI will send you, at your request, a personalized quote.